Tomorrow (Tuesday, March 23rd) you could have a whole day of free snacks - first at Starbuck's and then at Ben and Jerry's!!!!! 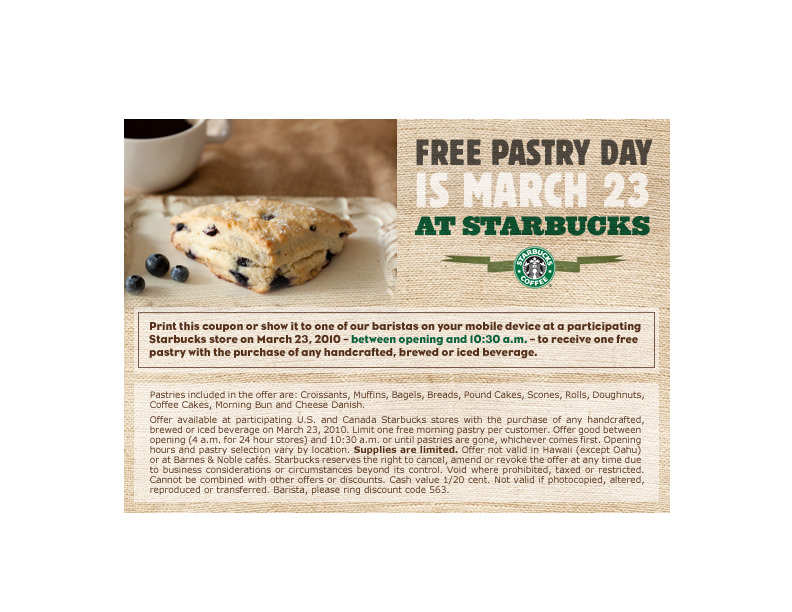 From opening until 10:30am, head to your local Starbuck's to get a free pastry with a purchase of any handcrafted, brewed or iced beverage (although you know I'm not going to get any iced tea since I know how to make that now!!!!) Just print out this coupon or show it to a barista on a mobile device. Then, between Noon and 8pm, head to your local Ben and Jerry's for a free cone of ice cream! me too! What drink will you get from Starbuck's? I may get a hot chocolate YUM!